Mastering quality professional studio stereo audio processor incorporating stereo limiter, stereo compressor and dynamic sound shaper functions. Suitable for use across stereo mix bus or individual channel tracks for live instruments and/or loops and samples of all types. All analogue singal path with easy to use, intuitive functionality and superb quality components offering very low distortion. Mastering quality professional studio stereo audio processor incorporating stereo limiter, stereo compressor and dynamic sound shaper functions. Suitable for use across stereo mix bus or individual channel tracks for live instruments and/or loops and samples of all types. 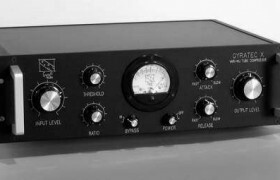 All analogue signal path with easy to use, intuitive functionality and superb quality components offering very low distortion. The Dynax2 is more than an ordinary compressor, it is designed as a Dynamic Sound Shaper, a creative tool meant for the creative sound engineers. Conceived around very low distortion circuits, the Dynax2 allows for a wide range of effects – starting with the smoothest and most transparent compression and going to the harshest and most spectacular sound crushing possibilities. Both “attack” and “release” knobs permit a graduated change of values to reshape the sound and create a new envelope. The Dynax Square offers three different compression curves :- Limiter (10:1), Brick wall and Anti-Dyna (an innovative new mode designed by Olivier Bolling which literally “over-limits” the sound in a “funky-to-trashy” way). All the components of the signal path are carefully hand selected high quality parts. The front panel is a 10 millimetres thick solid aluminium engraved piece of work. VU meter lighting allows user to see both output level or gain reduction. Over modulation cleverly turns the blue hue of the meter to a strong red!